Unlabelled Mummy as a child 2,000 years ago is returned to Peru by US museum. Mummy as a child 2,000 years ago is returned to Peru by US museum. 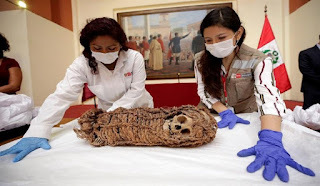 The mummy of a boy of Aymara origin, with an approximate age of 2,000 years, was returned to Peru by the Museum of Science and History of Corpus Christi in Texas (United States), informed official sources Friday. The Ministry of Culture said in a statement that the repatriation of the mummy was possible thanks to its coordinated work with the Ministry of Foreign Affairs. The document added that the technical reports indicate the mummy, of a boy or girl between 2 to 4 years old, shows evidence of a "Aymara type" cranial modification and is wrapped with string bones that expose his face and feet, so his origin "would probably be the altiplanic zone of the southern Peruvian sierra". The statement said that the characteristics of enfardelamiento indicate that it may belong to the Collagua culture. "The recovered cultural asset contributes to the knowledge of the funeral practices used by the pre-Hispanic societies that would correspond precisely to the north of Arequipa and Cusco, which has allowed the specialists to confirm their authenticity and belonging," said Deputy Minister of Cultural Heritage and Cultural Industries , Guillermo Cortés. In 2017, Mrs. Madeleine Fontenot, of the Texas Museum, informed the Peruvian Foreign Ministry about the possession of the mummy and on January 4 the museum delivered it to the Peruvian Consulate General in Houston, thanks to the efforts of the Peruvian embassy. in United States. 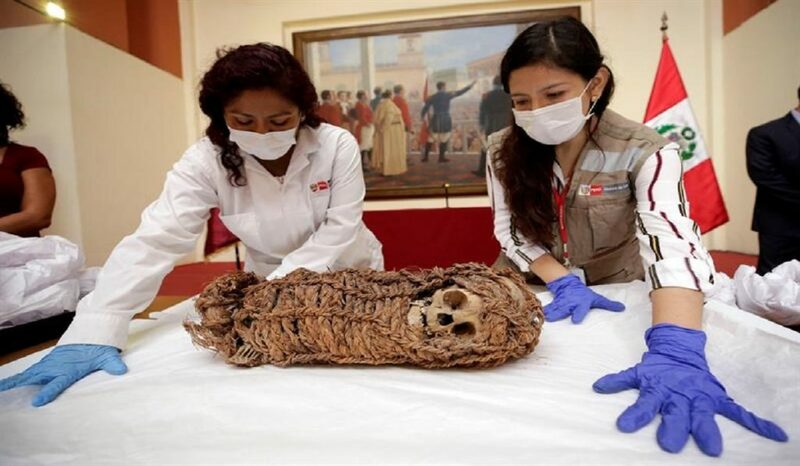 The Ministry of Culture explained that the mummy will remain in the National Museum of Archeology, Anthropology and History of Peru (MNAAHP), in the Lima district of Pueblo Libre, where radiological studies will be done to proceed with their respective registration.